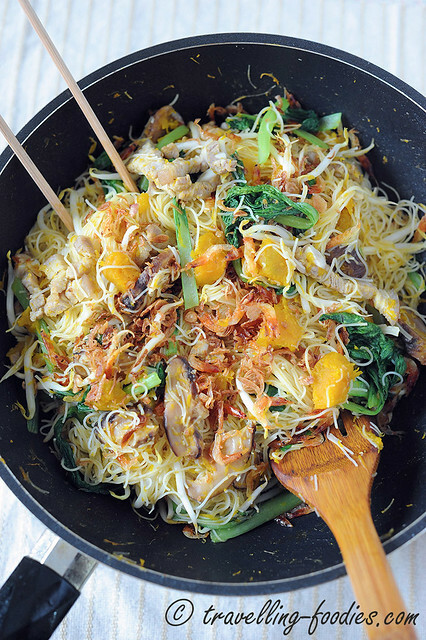 金瓜炒米粉 Pumpkin Fried Bee Hoon is a popular dish in traditional Taiwanese cuisine. The version I’d prepared is a Taiwanese Hokkien version, which is colloquially called “Kim Kueh Cha Bee Hoon” or simple “Kim Kueh Bee Hoon“. The ingredients are often simple. 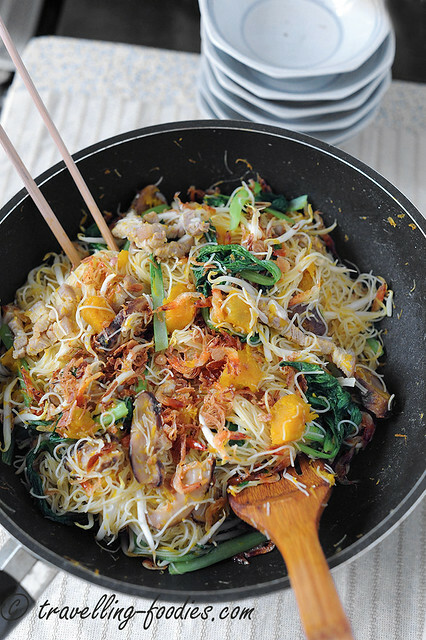 Apart from bee hoon, dried chinese mushroom, pork belly strips, bean sprouts and vegetables are often added. The default vegetable is actuall chinese cabbage, which is known as 高麗菜 Koh Leh Cai in Hokkien. It is much loved in Taiwanese cuisine because of the natural sweetness the cabbage contains. Otherwise, other green leafy vegetable like 菜心 Cai Xin or 青江菜 Shanghai Greens can also be added. Apart from pumpkin, the other star of this dish is 櫻花蝦 sakura ebi of course. Sakura ebi is much coveted in Taiwan now for its sweetness and umami flavours, only because of the influence of Japanese culinary culture. It is purportedly quite rare, compared to other similar miniature shrimp varieties as it can only be harvested in three places in the world, i.e. 桜えび or 桜海老 as they are known in Japan, can only be harvested in three places in the whole world. Apart from Suruga Bay in Shizuoka Japan, the other two are at 東港 Donggang in 屏東 Pingtung County, and the coastal regions of 龜山島 Guishan Island off the coast of 宜蘭 Yilan County in Taiwan. While they are enjoyed fresh in Japan as sashimi or on gunkan sushi, as well as added to tempura batter alongside other vegetables to become yasai tempura or yasai kakiage. 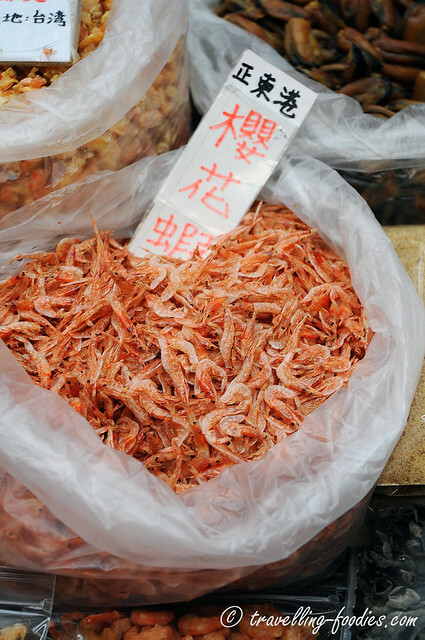 In Taiwan however, the shrimp are quickly dehydrated and sun-dried to intensify their aroma and umami flavours. Traditionally, Pumpkin Fried Bee Hoon uses 蝦米 dried shimp ”hae bee” which the Taiwanese locals call either 金鉤蝦 “Kim Gau Hae-ah” or 開陽 Kaiyang by the 外省人. However, during the times of the year when Sakura ebi are in season, these small little shrimp are added instead. 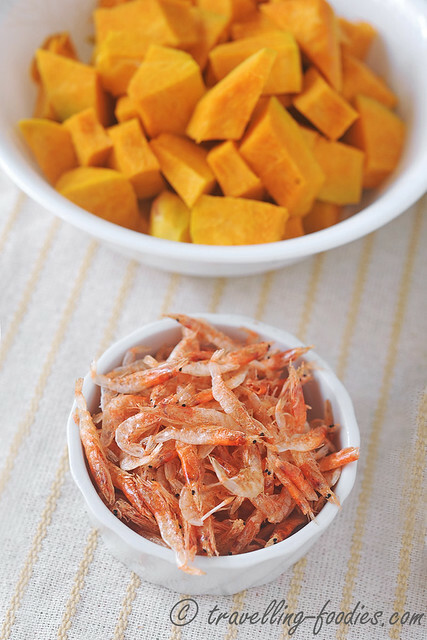 The flavours they exude are quite different from regular dried shrimp, sweeter, milder and less obtrusive which nicely compliments the pumpkin, allowing the natural earthy sweetness of the pumpkin to permeate through, which may have become masked if other dried shrimp varieties are used. In a heated wok, add cooking oil and saute sakura ebi under medium heat until slightly crisp and aromatic. Dish up sauteed sakura ebi and set aside. To the same oil in the wok, add pork belly and pan fry until it renders oil and become slightly brown adn crisp on the surface. Add 1/2 tsp salt and stir fry a bit more, before adding a cup of WATER. Stir fry for 5-10 seconds before covering with lid and allow to cook for about 5-8 min until the liquids have mostly evaporated. 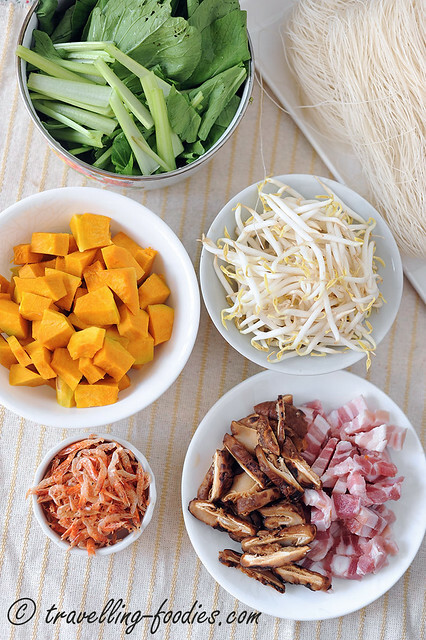 Add softened bee hoon, as well as pork broth and mushroom soaking water. Give everything a quick stir fry for half a min or so. Cover with lid and turn down flame to medium and allow to cook for 8-10 min until about half of the liquids have evaporated. Open lid and add green leafy vegetables, bean sprouts if using. Toss in half the amount of sauteed sakura ebi and fried shallot crisps. Using a pair of long chopsticks and wok spatula, toss to homogenise all the ingredients with the bee hoon. Season with sugar, pepper and salt at this moment if necessary. Continue to toss the bee hoon until all the liquids have been completely absorbed by the bee hoon. Add in the remaining sauteed sakura ebi as well as more shallot crisps if desired. Just before serving, drizzle black glutinous rice vinegar*, followed by rice wine around the rim of the wok. Give everything a good toss before plating. * if black glutinous rice vinegar is not available, omit entirely. 乌醋 black glutinous rice vinegar has an edge of sweetness to it which is not unlike balsamic vinegar. Do not substitute with other types of black vinegar as the others would have been too sour. ** if regular dried shrimp is used in place of sakura ebi, there is not need to dish and remove the shrimp from the wok after the initial sauteeing. Just continue to add pork belly strips and then the other ingredients as described in the recipe. *** cabbage requires more cooking time than the other leafy vegetables and is added first. Other green leafy vegetables are added later together with or after the bee hoon, Not too early or they will turn yellow when they are overcooked. 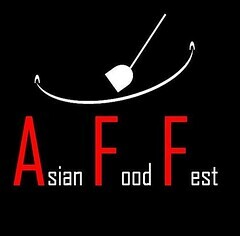 This entry was posted on August 31, 2014 by Alan (travellingfoodies). It was filed under Food, Simple Eats and was tagged with 金瓜樱花虾炒米粉, 菜心, 豆芽菜, fried beehoon, Pumpkin and Sakura Ebi Bee Hoon, Taipei, Taiwan, taiwanese， 香菇, 五花肉. Can you please let me know where to get the ebi prawns? I bought mine from Taiwan. In singapore, you can find them at meidiya and isetan scotts supermarket, and occasionally the food fairs at Takashimaya basement outside cold storage.